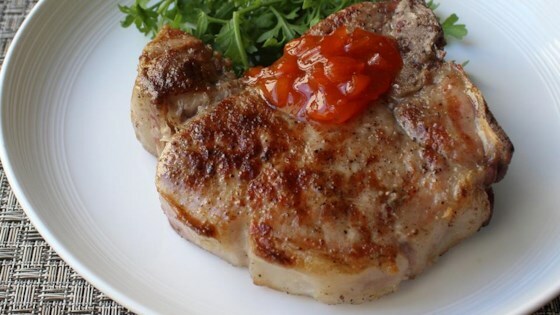 "Seeing the juicy pork chops in my friend Jennifer Yu's blog post (Use Real Butter) inspired this recipe, which features one of my favorite getting-meat-ready-for-the-grill techniques of all time. If you can call sprinkling salt on pork chops a technique. As long as you don't horribly overcook your meat, this 'dry-brine' technique will produce the juiciest and most flavorful pork chops you've ever had." Mix kosher salt, black pepper, and cayenne pepper together in a small bowl to make the dry brine. Generously apply mixture to both sides of pork chops. Transfer chops to a rack on a paper towel-lined baking sheet. Refrigerate uncovered 18 to 24 hours. Preheat grill to medium or medium-high heat. Brush pork chops on each side with a few drops of vegetable oil. Grill chops until internal temperature reaches 135 degrees F (60 degrees C), turning to evenly brown on each side. Transfer to platter and allow to rest 5 minutes. Let the chops "brine" uncovered in the fridge for 18 to 24 hours. Some say you can do this in less time, but I've always let it go at least overnight.